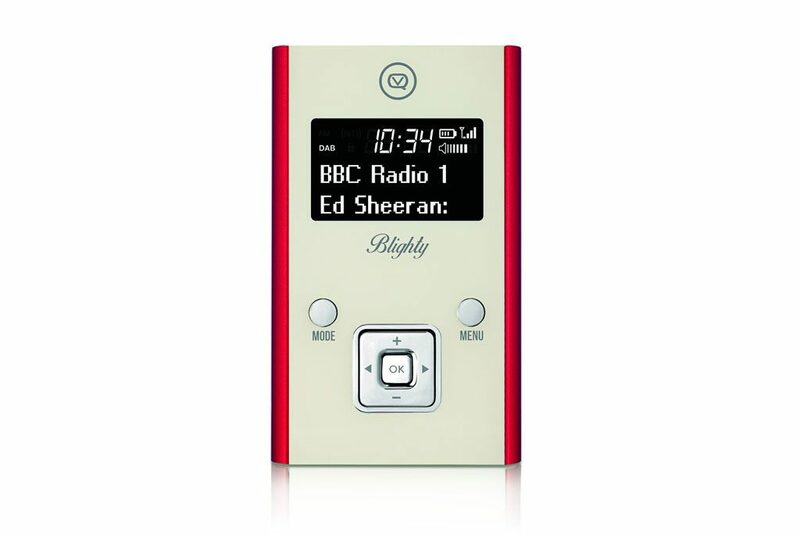 The VQ Blighty is a personal digital radio, ideal for music on the move or listening to news and sport commentaries. Designed and engineered in the UK, the stylish VQ Blighty comes in four colours. Like many other personal DAB radios, it features a display on the front. The high-contrast 1.6 inch screen shows the name of the current station, the time, battery level, signal level and volume. It also displays the mode – DAB or FM. A high-contrast screen is useful in bright sunshine. The radio comes with headphones, which also act as the antenna for DAB and FM reception. A power switch is located on the top of the radio, with a USB socket on the bottom. The USB port is used to charge the built-in 3.7V/800mAh lithium battery. A dedicated button is used to switch between DAB and FM modes. Like portable digital radios an auto-scan function is used to find and store available stations. A four-way key pad allows browsing of radio stations, with the centre OK button used to select. This is a different approach to some personal DAB radios which favour a jog wheel. VQ has been making digital radios with a selection of colours and interesting designs for a few years. The VQ Blighty continues this tradition with red, blue, silver and grey colour options. The anodised aluminium case and curved back make it feel good in the hand. Personal digital radios are great on the move. They don’t use mobile data and if they fall from a bag or pocket there’s no glass screen to shatter. This is even better when travelling or abroad with fewer opportunities to recharge a smartphone or find Wi-Fi. If you’re looking for a colourful radio, the VQ Blighty is also an alternative to the Pure Move 2520 and the Roberts SportsDAB 5. A three year warranty is included and VQ has a customer support team based in the UK. Verdict: VQ brings a range of colours and a rechargeable battery to the personal DAB/DAB+/FM radio.